Winter is coming. This year make sure you are covered every time Mother Nature decides to give the gift of snow and/or ice by hiring a commercial snow removal company to handle your storm management. While engaging in a fixed snow removal contract saves time, money and headaches, you need to make sure the contract fully addresses four key items. Every company’s needs and property are unique. Do you prefer to pay “per snow event” or would you rather a seasonal contract that allows for better budget planning? 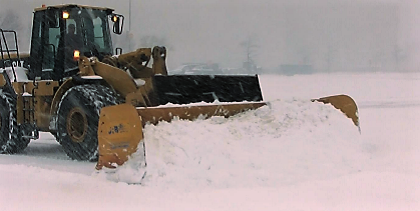 Is there ample room on your lot for snow banks or do you need to have the snow hauled away? Will landscape, wildlife or children be affected by specific types of snow melt and de-icing products? Your snow removal contract should clearly state the type of services you will be receiving, i.e., curb to curb plowing of parking lot, shoveling of walkways and stairs, application of salt, etc. Be sure EVERYTHING you want done is clearly outlined in your contract. The number of snow/ice events and the costs should also be stated. The snow removal contract should define what constitutes a snow or ice event. That can be defined by a time period of continuous precipitation and/or measurement of inches of accumulated snow or ice. Note that contractors may charge a surcharge for snowfall in excess of a certain number of inches, as well as for storms in addition to the set number of storms in a seasonal contract. Snow and ice storms can impact work production and sales. So, it is important that the snow removal contract specify when the plowing, shoveling, pre-treatment and de-icing take place. Will it be during the storm and continuing throughout? Is it after the storm has ended? You want a contract in place that will minimize the impact on your business. Responsibility should be addressed. Typical language includes not plowing or shoveling within a certain distance from parked vehicles, equipment or other actions, as well as Act of God events. Pay attention to what the snow removal company is and is not responsible for. A pre-season on-site review will allow the snow removal company to identify hazards and drainage concerns to determine the proper methods and techniques for managing the snow and ice.